Creating Sound – Kickstarter and its ability to do awesome. Kickstarter and its ability to do awesome. Now that the kickstarter has come to a close, I would like to take a moment and reflect on the process. First, the inception. I have always wanted to do my own dyno recording session, partly for the fun of the challenge but mostly for the experience. However, being broke and just out of school I didn’t really have the means to accomplish this. Until I attended an IGDA meeting here in the twin cities, where someone was discussing kickstarter for indie game funding. That got my wheels turning. That was also 6 months ago now, nearly. It wasn’t until I took the Mercedes out for a car show that it clicked for me. While I was out I overheard someone saying how cool it would be to have an audio recording of their car so they could remember it when they sold it on. I wanted to offer my services but didn’t really have the experience to prove that I could do it. (The car in question was a Mercedes-McLaren SLR, by the way. $$$.) But as I left the show it dawned on me that I had a cool-sounding car, that there were dynos in the area, and that I had everything else I’d need to pull off a session. Except the money. Attending GDC was a big confidence booster for me, to know that Track Time Audio was being read and that people were interested in what I had to say. But everyone I talked to agreed that I needed to show, not tell, that I am worthy of a sound design position instead of just a blog author. So as soon as I returned and I wrapped the Racing Game Sound Study with Damian I started planning a course of action. If you’ve never seen kickstarter before, you have to pick your rewards, deadline, and required amount before submitting as they are locked in place when you hit go. So figuring out what your budget is as well as what timeline you want your funding to take place is imperative. I decided early on that 30 days should be more than enough. I also figured out a budget for setting the recording session up. For me, first was finding the space. Dynos around here are around $100-150 an hour and I would need 3 or probably 4 hours, so a max of $600. I would also need to buy or rent a better multitrack recorder. I have been researching this for a while and for me to rent a Sound Devices 788T for a weekend would cost me about the same as just buying a Tascam DR-680, which can be picked up new from Musicians Friend for about $600 depending on the sale of the week. Also, since I had decided to offer TTA shirts as a prize I would have to pay for those. 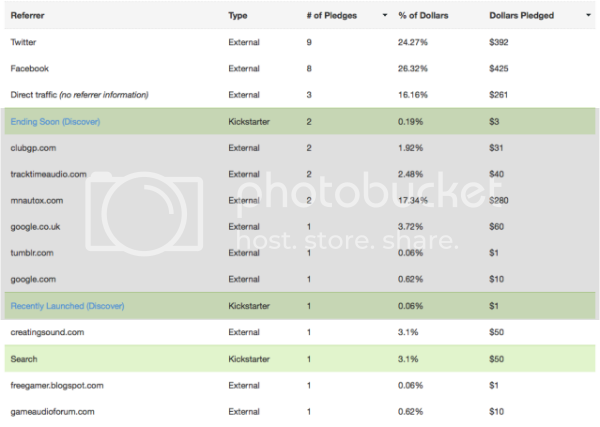 Lastly Kickstarter+Amazon (all payments happen through Amazon’s system) take a combined total of 10% of the donated amount, so including that in my required amount keeps me on-budget. I also had to balance how many people would chip in and at what amount to see if how much I needed to raise was feasible. Knowing that I could cover some of the additional costs myself, I landed on a nice round number of $1500 for a goal. The next trick is to come up with compelling incentives. I looked a quite a bit of other recording sample pack prices to weigh in where I should price mine. I found that most of the packs out there range between 100 and 150 for a limited license copy. I weighed in my lack of experience into the pricing (and my lack of metadata availability) to come up with the $50 price point, since that seemed like a fair compromise — I’m doing this to gain experience, not to sell sound packs. Seeing how many people donated at that price point I think if I were to do it again I’d bump that up a bit more. The other thing I had offered were the TTA shirts. Physical incentives have production and shipping costs that must be factored into the pricing plans. For example, if it costs me $20 to make and ship a shirt then selling them at $30 really only nets me $10. So, trying to gauge price points and number of donors per point is black magic and hindsight is probably the best way to plot that out. Part of the research I did included looking at other sound-based kickstarter projects, but I really only came across two. The first is René’s (of Designing Sound fame) Trolley library. The second is Joel Wilson’s pocket recorder kit project. Interestingly, they both ended up at about $1700, and it appears as though mine will too. Once those tough figures are done, it’s just a matter of writing the descriptions up in an interesting and informative way. And making a video. It’s the fun and the whimsy that keeps people coming back! Using a GoPro and pretending to be a Top Gear narrator was a blast. Maybe one day I’ll release the blooper reel. Everyone I’ve since talked to about kickstarter says doing video, even if it’s just sitting in front of your webcam and talking, significantly improves donations. And after all that planning and guessing and thinking and writing and filming and rewriting and editing and KS approval and more editing is all done, you hit launch. And then you take a deep breath. And hope. The night I hit launch, I let it sit. The next day, though, I was putting the word out on twitter, facebook, and every forum, club, or organization I could think of. To my surprise, Twitter was actually the most common referrer of people who donated. One art I haven’t learned quite yet is how to promote a project like this through social media without being overbearing. I think I did pretty well, though! No one told me to shut up at least, so. I learned the hard way that spending some time really thinking about licensing is quite important. I hadn’t put nearly enough thought into this aspect, and when inquired I stumbled a bit. As a result I had to change my plan of attack. I limited sales to only being during the donation period (where before I had intended to sell afterward) and opened up the licensing to accommodate people who wanted to use the sounds in video game production. I also was asked by some of the free sound community if there would be an availability there. Initially I had said no, as I did not want my backers to feel ripped off when someone else gets the recordings for free. However, seeing the demand and exposure meant I had to change it up a bit. I’ve decided to release up to 10% of the library onto freesound (and they won’t be useless sounds, either!) since the current free options for car sounds are rather lacking. I hope to be able to pair the free sounds with the FMOD engine designer tutorials such that if people want to experiment with it they have the source material to do so (as this is something I have wanted but could not find). The experience has been nerve-racking, humbling, and overall amazing. I am amazed by the sheer number of people who took interest in my aspirations and am so very grateful to everyone who backed, reblogged, or retweeted to make this happen. If you have questions on the process please don’t hesitate to ask me either by leaving a comment here or using the contact page on TTA. And now for the fun part! It’s looking like June 9th will be Dyno Day. So expect to hear a lot more soon! A very special thanks to the entirety of the Creating Sound crew for the Track Time Audio Love Week. As I understand it, they’ve set a new single-day-views record! When I started TTA a year ago I had never imagined it’d be this big. I only hope I can continue to deliver excellent projects and articles! David Nichols is the founder and author at Track Time Audio, a blog dedicated to vehicular sounds, methods of capturing them, and media that uses them. Track Time Audio - Speed Sounds Awesome.